Natural, Green SuperFood energy for a stronger, healthier immune system in a great tasting powder. Greens Plus Advanced Multi Wild Berry combines the original Superfood Greens powder PLUS essential vitamins, minerals, antioxidants, enzymes and dietary fiber all in one convenient great tasting powder! Greens Plus Advanced Multi Wild Berry combines with original Superfood greens powder PLUS essential vitamins, minerals, antioxidants, enzymes and dietary fiber all in one convenient, great tasting powder! Vitamin C from Camu Camu Berry. We've taken our original greens formula and made a new breakthrough - a 100% complete, greens based whole food multivitamin. By combining raw green foods, vitamins, essential minerals, enzymes, and Sambazon Acai & Wild Berry Extracts, Greens Plus Advanced Multi Wild Berry provides a fully charged blend of nutrients. Greens Plus Advanced Multi Wild Berry is 100% soy, gluten, and dairy-free. 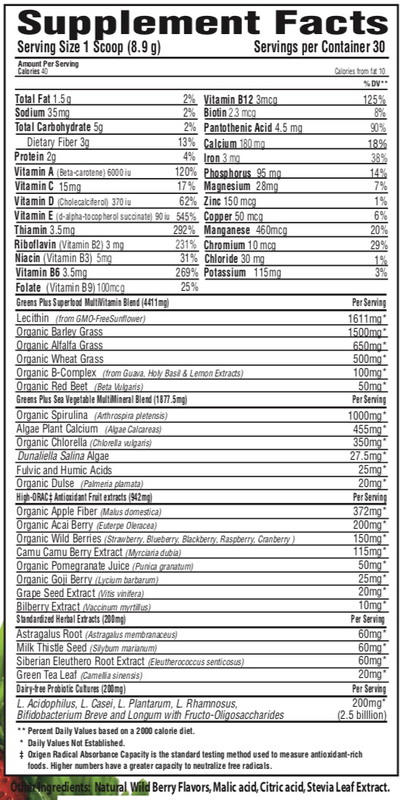 All Greens Plus Advanced Multi powders are Non-GMO. One serving of Greens Plus Advanced Multi Wild Berry is equivalent to 5 servings of fresh fruits and vegetables based on ORAC*. Greens Plus Superfood MultiVitamin Blend (Lecithin [from GMO-Free Sunflower], Organic Barley Grass, Organic Alfalfa Grass, Organic Wheat Grass, Organic B-Complex [from Guava, Holy Basil & Lemon Extracts], Organic Red Beet [Beta Vulgaris]), Greens Plus Sea Vegetable MultiMineral Blend (Organic Spirulina [Arthrospira pletensis, Algae Plant Calcium [Algae Calcareas], Organic Chlorella [Chlorella vulgaris], Dunaliella Salina Algae, Fulvic and Humic Acids, Organic Dulse [Palmeria palmata]), High-ORAC Antioxidant Fruit extracts (Organic Apple Fiber [Malus domestica], Organic Acai Berry [Euterpe oleracea], Organic Wild Berries [Strawberry, Blueberry, Blackberry, Raspberry, Cranberry], Camu Camu Berry Extract [Myrciaria dubia], Organic Pomegranate Juice [Punica granatum] Organic Goji Berry [Lycium barbarum], Grape Seed Extract [Vitis vinifera], Bilberry Extract [Vaccinum myrtillus]), Standardized Herbal Extracts (Astragalus Root [Astragalus membranaceus], Milk Thistle Seed [Silybum marianum], Siberian Eleuthero Root Extract [Beutherococcus senticosus], Green Tea Leaf [Camellia sinesis]), Dairy-free Probiotic Cultures (L. Acidophilus, L. Casei, L. Plantarum, L. Rhamnosus, 200mg* Bifidobacterium Breve and Longum with Fructo-Oligosaccharides) Other Ingredients: Natural Wild Berry Flavors, Malic acid, Citric acid, Stevia Leaf Extract.